Concept albums are by no means everyday fare and this collection of songs with the common denominator Wanderer is a nice idea, even though the last few Schubert songs have more to do with transportation on water rather than land. Anyway this is an attractive choice of songs, selected to expose the singer in the best possible light. Christoph Sökler made his operatic debut in 1998, having studied with, among others, Dietrich Fischer-Dieskau and Elisabeth Schwarzkopf. The present disc was recorded in 2005 – why did it have to wait for almost five years before it was issued? – and reveals a light lyric baritone, employed with the utmost care for fine nuances and colours. He is an accomplished singer who seems to feel most comfortable when using his half voice and he is careful not to expand the volume beyond his natural powers. This may give an impression of his readings being small-scale, and by the side of his teacher Fischer-Dieskau he lacks the magnificent attack and volume. The difference between the two singers is that F-D’s voice carries in the vastest of venues - Festival Hall, Carnegie Hall – whereas Sökler is a man for smaller recital rooms. Historically speaking this seems to be absolutely right at least as far as Schubert is concerned. In the few songs that require a large voice, like Auf der Bruck and Mahler’s Ich hab’ ein glühend Messer he has enough heft to encompass also these dramatic outbursts. But he is at his very best in more inward and toned down songs. Nachtstück and Nachtviolen are masterly and Im Frühling sensitive and … sensual. Yes, there is a light shiver in his voice that conveys sensuality. It is apparent also in Am Meer. This is one of most hauntingly beautiful of Schubert’s songs and even though he can’t quite challenge the hushed intensity of Fischer-Dieskau’s 1954 recording with Weissenborn, Sökler’s reading is also one to savour. The overriding impression of his style and voice character is one of youthfulness – just listen to Der Schiffer. 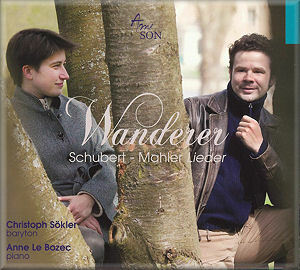 And when we move from Schubert to Mahler it is again a young wayfarer we encounter. Wenn mein Schatz is sung with rather marked rubatos, which gives the impression of hesitation – but it isn’t unbecoming. Ging heut’ Morgen is bright and jaunty and Ich hab’ ein glühend Messer intense and very much alive. The concluding Die zwei blauen Augen – Mahler’s most beautiful melodic inspiration – is permeated with suppressed sorrow, the final line Und Welt und Traum just fading away. This is singing to set beside that of Fischer-Dieskau and my long time favourite Heinrich Schlusnus, recorded when he was way past sixty. Both those older singers were recorded with orchestra and are thus not quite comparable. A little over three years ago I reviewed the debut recording by Rodion Pogossov, awarding it Recording Of The Month. He also sang the Mahler cycle with piano and with a more powerful voice that took the dramatic heights more readily. Sökler’s reading has its own validity within its more recessed scope and this is altogether a very fine disc, further enhanced by sensitive accompaniments by Anne Le Bozec. What is less appealing is the sound. Recorded in an over-resonant venue the sound is not ideally clean, which affects the piano tone. Even with this drawback this is a disc that requires to be heard.